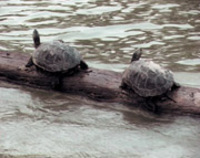 In their short 2005 film Amphibious (Login-Logout), Jennifer Allora and Guillermo Calzadilla follow six turtles sunbathing on a log as it floats down China’s Pearl River. The six minute film features a sequence of overhead shots of the turtles themselves, alternating with a series of point of view shots of the banks of the river. The early, day-time scenes feature mainly fishermen and small boats, but as evening falls and the turtles drift further and further downstream, the river banks become increasingly populated by warehouses, apartment complexes, and huge cargo ships. The film, therefore, creates the impression that the turtles are not only moving through space, but also through time, providing us with a capsule vision of China’s precipitous industrialization. The film creates the conceit that we are viewing this industrialization through the eyes of the (presumably) oblivious turtles, though we cannot help but project onto these scenes our own understanding of the environmental impact of this precipitous process of industrialization. It is precisely this question of the environmental impact of China’s industrialization, meanwhile, which is the explicit focus of a more recent river tour: Jim Yardley’s interesting article on the Yellow River in the NY Times a few weeks ago. The Yellow River, then, is like a path into the future. To follow it is to watch China's struggle to get there. Yardley emphasizes, particularly for the Northernmost most regions through which the Yellow River travels on its inexorable march to the sea, the water it provides is both a boon and a curse. Without it, many of these regions are too arid to support more than a minimal population and economy. The river, therefore, makes possible economic development, but at a formidable cost, insofar as the regions then become dependent on agriculture which relies heavily on water from the river, as well as on “energy-intensive, heavy polluting industries that other regions no longer wanted.” The result is comparable to what, Jared Diamond argues, befell the Mayan civilization in present-day Mexico. Their cultivation of maize dramatically increased the available food supply and, in turn, allowed the population to explode. However, an inevitable side effect of the development was that the population necessarily become increasingly dependent on maize for survival, and as a result suffered wide-spread and long-term nutritional deficiencies (particularly iron deficiencies). In short, Yardley’s tour of the Yellow River creates a kind of split gaze similar to that of Allora's and Calzadilla’s turtles, insofar as we both share Yardley’s critical view of the environmental devastation caused by this overdevelopment along the river’s banks, while at the same we are also shown the embedded turtle-like gazes of local and national officials, many of whom are deliberately turning a blind eye to much of that devastation.